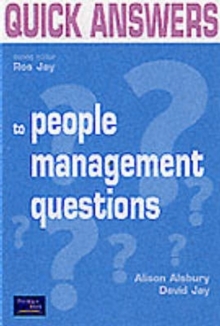 Got a people management question? We'll put the answers at your fingertips... You're a busy manager. People bring challenges, and you need solutions based on hard facts. Hiring, firing, incentivising, winning talent, keeping talent - whatever the topic, Quick Answers to Key People Questions will give you the answers you need and take all the hard work out of decision making. Should I check out references? What is the average graduate starting salary? What actions can be taken for employees with poor attendance records? Do appraisals increase motivation? Does team working work? What do people look for in a job? What are the advantages and disadvantages of the key recruitment channels? What kind of training should be provided to keep in line with competitors?We collect all your most vital questions, dig for the statistics from every conceivable source, read them, interpret them and give you the bottom line answers with vital figures. Intelligent analysis and additional commentary ensure you know whether the figures apply to you, and what you should read into them, making your life simpler - and more successful. This essential guide gives simple succinct answers, backed up with hard facts, to all the people management questions you have ever wanted to ask. We've done the hard work - so you don't have to.